If somebody asks me to point the biggest goof up of recent times and the one classic example of – ‘wrong person at the wrong place’ then I might not look much beyond Kapil Sibal. Looking at what happening to him for some time, one can only pity Kapil. Given the thankless task of protecting the UPA (read Congress & the first family) from their atrocious records on corruption; he seems to have no option but to fall back on the age old trick of politics – “If you can’t look good yourself then be sure to make your opponents look worse”. First he tried to save Congress by giving a clean chit to A.Raja by claiming that no money was lost in 2G spectrum scam. He failed miserably – didn’t he? Now, with Raja behind bars and his alleged syndicate in crime Sadiq Batcha committing suicide (did he jumped or was he pushed? ), Sibal is looking distinctly more foolish than Jugal Hanshraj, who still thinks he is an actor with unimaginable acting prowess. His zero loss theory is in tatters with him and a whole bunch of others from his ministry, running all around for covers. But could these slaps possibly stop him from trying one more time, knowing how veracious a fighter he is? Possibly not and in fact it hasn’t. On Monday he almost distributed pamphlets on each traffic junction of Delhi by claiming how the Tatas enjoyed a free ride at VSNL since they failed to return the land belonging to the disinvested company, as per the terms set during 2002. Indirectly Mr.Sibal is trying to say that the NDA government under Atal Bihari Vajpayee allowed the Tatas to benefit from the land without paying a penny. In a March 15th internal note to the current telecom secretary he showed his disbelief on the whole arrangement and how he smells fishy on the execution of the deal as it doesn’t seem fair and transparent from the looks of it. According to him, if anything that needs to be probed first, it has to be this dubious deal. Raja can take the backseat for the time being. A strong set of nose I must admit; which can smell (even fishy) when there is nothing to smell, to begin with. He went on to add how the associate partner has enjoyed the 773.13 acres of surplus VSNL land without paying anything for it. According to him the way the whole disinvestment was handled in 2002, not only hampered the interest of the investors but also other stake holders (including the Government) in equal proportion. 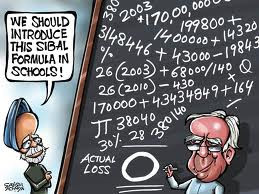 Mr.Sibal, either you are trying to be too clever by half or the belief in conspiracy theory, coupled with too much Ekta Kapoor flicks has taken a heavy toll on your mental furniture. But for your help the facts of the disinvestment as follows – First and foremost, the disinvestment proposal excluded the sale of this surplus land of VSNL. The said land was supposed to be parceled out to some other company, so that the investors in the easterly VSNL could benefit, which includes the government. But strangely, neither the government nor the Tatas moved in this direction with any sense of urgency. But who should be blamed for this delay? In the nine years since the disinvestment of VSNL in 2002, till today, NDA was only in power for two years where as you guys were there for the rest seven. Hence the blame thus be appropriated by the help of a little mathematics – 25% to the NDA and 75% to UPA. I would even love to corroborate it to 90% on your head as the first thing you guys did after coming back to power is to dissolve the disinvestment ministry without getting a grip on all the disinvestment details the previous government carried out. In any way the Tatas haven’t yet gulped down the land for their own use, and it is still at the disposal of the government to reclaim it. Hope you are aware of this little fact before turning a smarty pant accuser? So the bottom-line; the 773 acres of land which was some hundred crores back in 2002 is now a whopping 10000 crore. So no scams Mr.Sibal – Just some undeserved bonanza for the UPA. If still your conspirator mind is dying to unearth some scam of NDA era, then here it is Mr.Sibal. It not only will embarrass the NDA but would also give you some political bonus. If possible do investigate this than the non-existing land scam. It is a fact that the then telecom minister, late Pramod Mahajan wanted to end the monopoly of VSNL in international calls by disinvesting it. But the surprising point is he somehow decided to do it a good two years before the schedule. So now the point arises – VSNL as a government company, which is even listed outside has told it’s investors about its monopoly in international calling till 2004. This was basis on which VSNL shares were sold in GDR markets and domestic as well, when it was listed earlier. So what happened to those promises made by a state owned organization to its investors? When the disinvestment was done early, this very promise was broken. That is also fine, provided VSNL and all its investors are adequately compensated for this loss of revenue. I am sure this didn’t happen. VSNL was marginally compensated by having some long distance call and the then government in a press brief gave a kind of vague statement saying the rest balance would duly be settled later. This again never happened. So, if at all you have anything to investigate then can dig into the policy framework of Mr.Mahajan than attacking a genuinely honest Arun Shourie. When the buzz was that a favored company would win the bid, Mr.Shourie being the disinvestment minister, made it a transparent affair with Tata winning the bid fair and square. After that a new conspiracy emerged when the whisper was that the favored company leaned on Mahajan to make sure that the Tatas get an empty vessel. And that precisely what happened with Tatas being sold a pup and the losing bidder Dhirubhai Ambani (another crook in an Armani suite) might have had the last laugh. So in effect by early disinvestment the government effectively cheated the pre-disinvested VSNL shareholders, both international and domestic. A VSNL suit in some Indian court made precisely these claims, while it is not clear what came out of it. So someone should figure out what was achieved by robbing VSNL with its foreign call monopoly, earlier than schedule resulting in its investors and stake holder’s interest put in jeopardy than some non-existing land scam. Hope Mr.Sibal has long past his days of school boyish ego centric mentality.